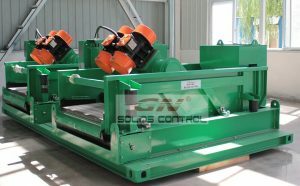 GN Solids Control recently just offer some HG dryer, decanter centrifuge and mud tanks to Middle East clients. They win the tender with our solids control proposal and bought from us the equipment. The former stage requirements, including below. Skid mounted system for HG dryer. 50 bbls fluids holding tank for HG dryer. 2 sets GNLW363CG decanter centrifuges, with belt pulley and belt to adjust the bowl speed, and 3200RPM /2500RPM / 2200RPM bowl speed available. 2 sets telescopic skid with screw pump for feeding the centrifuge, the skid height can be adjusted to 2meter or 3.3meter, which much convenient for the user installation. 1 set HG dryer with necessary qty shaker screens. GN 4 panel shaker screen is equivalent to Swaco Mongoose shaker, reliable working performance and good price. 1 sets spare parts for the operation of centrifuges, High G dryers. As the leading brand of solids control, GN always give best support to our old clients and new clients.